Apologies if this has been posted on the site already, but I hadn't seen it on here and it's pretty incredible. Philip Seymour Hoffman talking philosophy with Simon Critchley. Topics include: the nature of happiness, how we deal with our pasts, Magnolia and The Master. There's a great story about PTA coming to visit him when he had just fallen in love with a girl and wrestling with him in a diner. dont lie, how many people cried during that AMAZING video? thank you, max, i'm not trying to be cheesy by saying this, but i think that actually gave me a sense of closure. its funny when you grieve over someone you've never met. its almost like grieving over a fictional character, you know? i know him best through his characters, and they've all come to an end when his pictures finish, and they come back alive when you begin the film again. and as immortal as that sounds, the true tragedy for me is the death of all of his characters including ones we've never seen. but that was just beautiful. if this has been mentioned, i apologize, but this has got to be a question on everyones minds: is paul going to say anything about his death? or has he already? anyone? bueller? Probably as close as we'll get hearing about him speaking publicly on it..
Maybe someone who was there will post some specifics of the eulogy. It would be nice to hear what PTA had to say. Agreed, that interview has some great insight into happiness and death and the movies PSH has been in. It's surprisingly relevant to the recent events. On the subject of grieving over someone you don't know, this is actually the first time one of my personal (living) heroes has died. It doesn't seem real, I still find myself thinking about him and realizing he's gone. It comes as a shock every time for me. I'll admit to legitimately crying myself to sleep the night I found out. It'll take quite a while for me to get over this, a lot of people were really attached to him and his characters like you said. I think it's especially tragic considering his talent. He found real, believable human beings in every character I've seen him play. Best wishes to him for whatever comes after life, if anything. Master would have told us to laugh. /end of attempted meaningful post. I was rewatching The Master again last night and near te end, when he starts speaking about meeting again in another life, it just felt too much to bear. The filmmakers behind the “Hunger Games” movies will digitally recreate late actor Philip Seymour Hoffman in a major yet-to-be-shot scene, sources from the flick said. Editors will use computer graphics and camera tricks — instead of rewriting the script — to film at least one heartfelt scene featuring Hoffman’s character, the gamesmaker Plutarch Heavensbee. “You can do digital things, you can have conversations where you’re not focusing on him but the people he’s talking to,” an insider from the film company Lionsgate told Hollywood Reporter. Hoffman had almost finished filming “The Hunger Games: Mockingjay Part 2,” due in theaters in November 2015, before he died of a heroin overdose. Are those hunger games movies any good when you don't factor in psh? They look really terrible from the trailers. The first film was very "blah." I thoroughly enjoyed the second one on a date night with the wife. 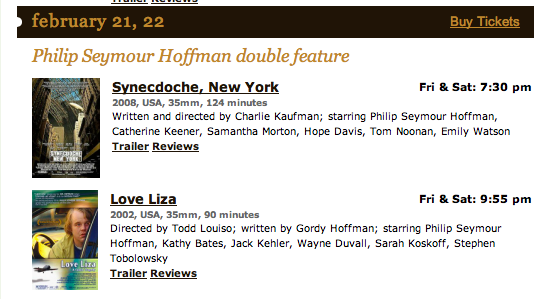 Hoffman's role, while important, is no Lancaster Dodd. He's an ancillary character. I only saw the first one and thought it was terrible. From what I've heard, Hoffman's character is supposed to gain some protagonism in the last two movies of the saga. I'm considering watching the second one and then the others when they come out, just so I can watch PSH again on the big screen.